ProPuppet is an animation tool that brings the power of image manipulation into Final Cut Pro. Easily create fun and silly animations using a simple mesh and puppet pin interface. Instantly bring still images to life with the click of a mouse! *This plugin is only compatible with 1080p projects and will not work in 720p or 4k resolutions. *This plugin will not include the puppet images displayed in the promotional video; the images are sourced at the end of the video. *ProPuppet will require Mac OS 10.13 High Sierra and FCPX 10.4. Instantly add organic motion to still images within Final Cut Pro. With ProPuppet video editors now have the ability to create puppet animations with easy-to-use controls. Simply adjust the mesh count and add puppet pins to their corresponding joints. 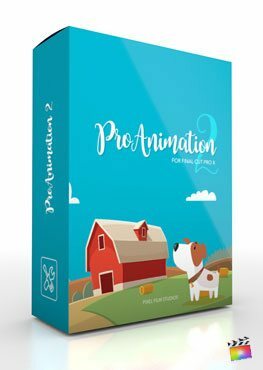 With ProPuppet, users can quickly animate any subject with incredible ease. The ProPuppet mesh can easily be manipulated by adding pins to anchor the mesh triangles. Limitlessly add pins using the hot-key “Shift + Click”. Warping the image is as easy as clicking and dragging the pin points. In addition to object manipulation, Final Cut Pro users can also keyframe pins to create silly animations. Simply activate the keyframes next to the control points in the inspector window, scrub down the timeline, and reposition pins. Redefine the way media animates with complete control over wire mesh. Using simple sliders and mesh on-screen controls, videos editors have the ability redefine the way media animates in Final Cut Pro. Animating inanimate objects has never been so fun a easy to do with Final Cut Pro. ProPuppet was professionally designed to work seamlessly inside of Final Cut Pro X. As a generator the ProPuppet preset can be dragged and dropped onto media and previewed in real time. With the published parameters found in the FCPX inspector, users have the ability to make further adjustments with just a few clicks of a mouse. This is a 2-part tutorial that first demonstrates how to how to warp an image and how to animate an image using ProPuppet in Final Cut Pro X. How do I make my image appear in the viewer to apply points to? The image will first need to be applied to the drop zone in the inspector window for this plugin. Once it has been applied, select "New Image" then "Show Mesh" to begin applying points. What resolutions can I use this plugin in? The resolution that is supported by this plugin is 1080p. What format does my image need to be in to use this plugin? The image must be a .png and it is vital that the associated alpha levels of the image all be the same in order for this plugin to work properly. Here are the best practices for using plugins from Pixel Film Studios. Here are some quick tips to optimize the efficiency of Final Cut Pro. I installed ProPuppet and see a red screen similar to this. Scenario 1: Run the installer until reaching the successfully installed message and restart both Final Cut Pro and your computer.